Congratulations! Your blog is delightful! Have a great weekend! Oh congratulations - how exciting for you, but also, well deserved. I have only been following you for a teensy weensy amount of time - but it has certainly been quality time, I think! Your posts are the ones that make me smile when I see them in my reader - the ones I look for & scurry over to read in full & gaze adoringly at the pictures. You make me laugh & inspire me, even in the short time I've known about you. I will surely be keeping watch on Monday for a chance to win what looks to be an amazing magazine, but if, heaven forbid, I fail to win, I am definately going to investigate how we can get our grubby hands on one on this side of the world. Just as you thank your readers for joining you on your blogging journey, I have to thank you for having us along. Now, if you'll excuse me, I have to morn the fact that I missed out on that adorable yellow birdie...! I never even realized that there was a magazine about blogging - you live and learn. I feel that there is a whole new genre emergent in the world of words. And I have just noticed that I have some boots rather similar to yours - but perhaps not as we live on opposite sides of the briny - mine are a dark teal, but made by someone called London Fly, whoever he may be. He actually sounds a rather unsavoury chap, and I am not sure where he has crawled out from. But I have always affected wellies in all their forms, and these do seem a step up from green Hunters. Congrats on the publication! Your words always make me smile and I look forward to each post since I have stumbled upon your blog:) So THANK YOU and enjoy your moment and do a little happy dance!!! Those who have been rescued would have it no other way you know. Congratulations with the wonderful article in the magazine! That is just super crazy good! I may have to invent an excuse to slip out of the house this evening, perhaps something to do with lending a shoulder to a lovelorn friend (I happen to have one particular friend who is dreadfully lovelorn at any given time - so totally plausible) and wing my way to the nearby chain book store that carries that little publication. I will set up cozy camp there in the store and read your pages. The "challenge" prevents me from buying said magazine of course but, take a good long look...that I can do. As Alabama says to Clarence in True Romance, "You're so cool, your so cool, your so cool!" Hurrah! Hurrah! Hurrah to you! Very exciting, indeed to be in such a great mag! I will have to look for a copy so we can read the entire thrilling tale! As far as I know, we can't buy Artful Blogging here in old Blighty, but if we could I'd be down to WH Smiths PDQ to get a copy and read your article. It is of no surprise whatsover that your unique artfulness has been celebrated in the magazine! It is precisely because your blog is unique and (my fav description) quirky that I stop by to read each post. Thank you for bringing a ray of sunshine to each and every day! Ya brought tears to my eyes. Let me please take this moment to say that I am so so so so SO so sO so so so SO glad that you didn't quit the blog back when you were pondering it. You really do bring joy into people's lives, by bringing a little bit of dottie to everyone. My dear husband started reading your blog today, and he confessed that he honestly likes it. Now THAT'S something! p.s. absolutely loving your stool in your shop along with all your other treasures. As a Mom of 5; I have often pondered my sanity while talking to my creations, knick knacks, chickens, and dogs. They never answer verbally but speak volumes otherwise. i'm a newbie in my readings but love the sense of realness and goodness i find here. congrats on the article. love this ... can't wait to read it!...you are truly one of my blogging idols! happy to be a 'reader of the utmost kind'.... congrats to you, looks like a lovely article and a fab place to be honored! Tif that is absolutely fabulous and oh so exciting for you and the rest of us, I can assure you!!!! It looks wonderful with all your lovely photos and what I could read, it read just like a big blog page of yours. I am very proud of you and I look forward to your future bloggings too. Well done!! 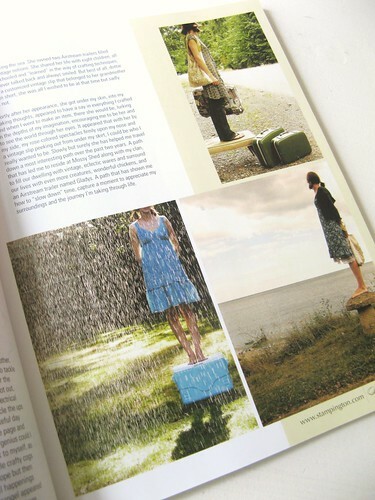 How amazing, congratulations on your little snippit in Artful Blogging! I love coming here and enjoy stepping into a world I would love to live in. Gives me and outlet from my mess and little people. So Thanks You. I'm one of your "short-time" friends and love what I read and see. It also makes me feel better knowing there's someone else out there who loves to dress the way I do....although you do it so much better. I can look at your pictures and so "There...see that's what I aspire to".... actually looking postcard pretty while wearing these funky threads. My daughter will hate you though, she of the must-fit-in tendencies, as she is already mortified to be seen in public with me. Huzzah! Well done you and jolly well deserved by the looks of things, I'm quite new to your blog, so have much cathching up to do but I think I'm going to have many 'gleeful' moments over here! Congratulations!! You really deserve all the attention! How many times have your thoughts and manner of "being" encouraged and "lifted" me on my day to day walk! Thankyou for blogging and being an excellent blogger of the utmost kind! You should really write a book! I'd buy it. I do so enjoy your gleeful moments;) And I so enjoy your blog, thank you. I´m also up for your challenge! Congratulations!! Your blog is beautiful and inspirational. 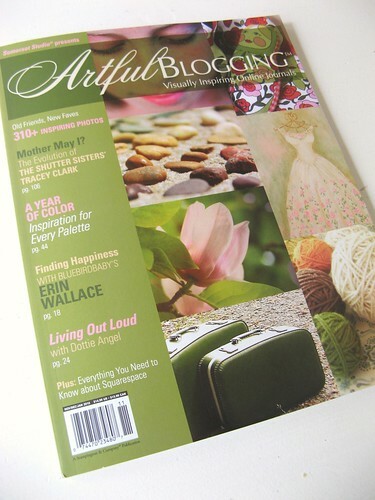 I love that you have been included in Artful Blogger! 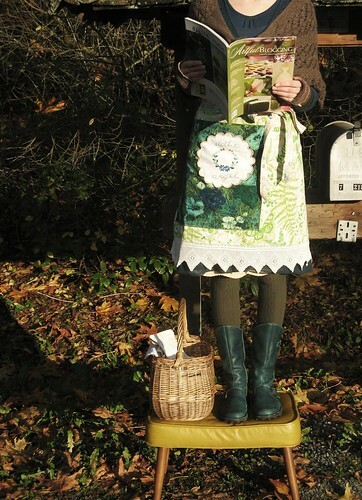 And, may I say, that I particularly love you stool-standing photos! That's how I discovered your blog and your challenging challenge! Actually, it was the chicken on the table that made me look you up. And yesterday, while taking my little Iris to the vet, a lady there told me about one of her chickens that they raised inside after a coyote incident. It comes inside the house every morning and lays an egg in the pet caddy. It also pecks at the door to come in for the evening. Well...I immediately flashed back to your chicken photo, and I thought "what a great little blog post her story would be (with pictures, of course)." Hopes for a wonderful day! I love love love your wonderfully beautiful style. I have received many comments on the pictures that I have shown from your blog on mine. You convey a serenity which is great meditative. I picked this up at B&N last evening. Your section in the book is delightful! The entire publication is fantastic. What a beautiful, beautiful article. Congrats, and well done...you are showing us all how sweet it is to live an artful life. I am a new reader,fan,follower,...! and I did a little post about you the other day. You can check my blog to see if you want. Anyway, just want to say thank you for bringing beauty to our eyes! Oh hi, Sinnlighet profiled you and I just had to come and have a look. 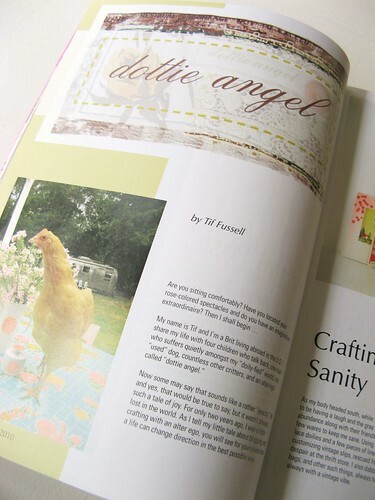 What an honor to be chosen by Artful Blogger, I love how they put the magazine together, it is so beautifully done. I love how you focus on the simple things in life, it's a joy to read your blog. You've the most beautiful and inspiring blog and you write things with so much humor and make blogging an ART. My 12 year old daughter Pippa said last week when we were looking in a magazine together; "that's so Dottie Angel" and she was so right! Congratulations on your issue in Artful Blogging! Congratulations! I have been reading your blog for only a few days now, but I LOVE it! 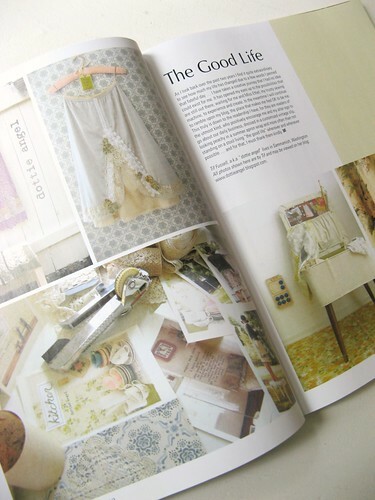 That is wonderful that you are in the magazine! Tif...what fabulous layout to a wonderful artist and liver of life!! amazing. inspiring. pretty. comfy congrats to you. Wow---i almost didn't shell out the money for Artful Blogging but last night i was waiting to catch a train home from Chicago and i really, really wanted it so i splurged and am so super-excited that i did!i spent most of the morning reading your blog am just in love. love your writing, your beautiful pictures and most of all your humor! as a new blogger myself, i found your article as well as others so insightful and helpful! so happy to have found this blog! Tif, I am so happy for you! Congratulations! That is so great. I can't imagine what a thrill this is and I can't think of anyone more deserving for all the inspiration and creativity you offer up to each of us every week. You have the most beautiful blog and your own unique style as well as a humorous way of writing which is immediately recognizable as 'you'. Keep it up, you've got what it takes to go places!--and enjoy every moment of it. well, i am blown away by your warm and plentiful comments... i thank you again, all most kindly and am looking forward to a 'gleeful' week with you all. i too have spent a bit more time than usual in the real world this weekend, and so have just read all about your fabby feature... all your pics are looking 'peachy perfect' in print... and how about all these wondeful comments!? This is very cool Tif! Well Done You! A most magnificent milestone!! i treated myself to this magazine after you mentioned it and so glad i did. wonderful article! congrats to you! Oh well done you, that is so exciting. 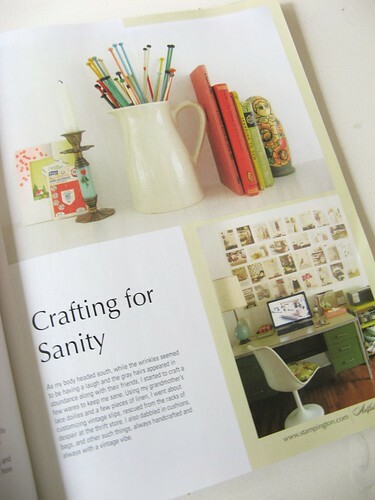 love the spread in artful blogging! what breed of chicken is in the photo, she is lovely! 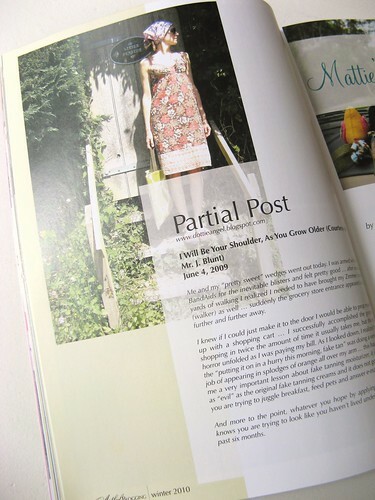 and once again, may i just thank you all for your lovely comments on my 'artful blogging' moment! 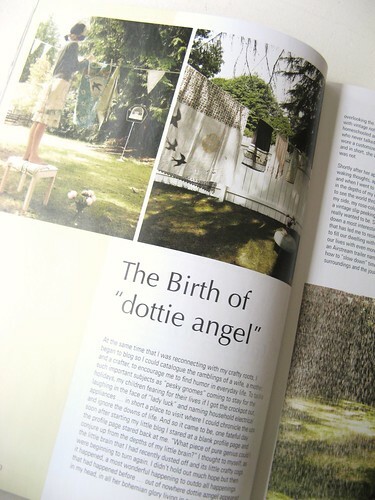 I just stumbled upon your blog from artful's latest issue and your blog is lovely! But I must admit the abundance of 'quotation' marks drive me batty.